“Classroom Training” does not equal “Boring Training”! It is an unfortunate truth that there are a lot of “Leadership Training” or “Team Building” workshops or seminars out there that are… well… boring. It has become common to hear groans of distress and expressions of angst from people who have had, shall we say, “less-than-stellar” experience in these sessions. However, that doesn’t have to be the case. Leadership training and team building events can be a very powerful way to add energy and enthusiasm to your team while passing along time-tested skill sets that in high demand in the business world. However, it is important to understand the semantics of the industry so that you end up with an exceptional activity or workshop versus a boring one. The more focused you are on the results that you are looking for, the more likely you will be to pick the perfect solution for your team. Consider the following criteria when evaluating your next training workshop. Look and listen for key words such as ‘interactive’ or ‘experiential’ in the description of the training session you are considering. And ask for an example of what is meant by using those terms. Usually, these terms mean that the class participants will actually participate in the session somehow. This is absolutely essential because we don’t learn stuff just by listening to it. We learn by interacting with the material. In short, we learn by doing. The more active the workshop, the more enjoyable it will be for the participants. The more passive the workshop, the more droopy eyes you will see from the participants. If the person trying to interest you in the training is not asking a lot of questions about you, your company and your expectations, shop somewhere else. This is a sure sign that they have no intention of trying to meet or exceed those expectations, and could risk wasting your time and your money by delivering a training session that is not appropriate for your team’s needs. The facilitator doesn’t necessarily have to customize, or even tailor, the material to the group, but with a few simple questions up front, the facilitator should be able to match content with the needs of the group. Understand that not all training is created equally. The more you know about what you want to get out of the training experience, the better able a training consultant will be in a position to help you find the right match for your needs. Sometimes a team in conflict really shouldn’t spend their time and money on a training session that is designed to really just let a team play together. Sometimes that team in conflict needs something a little more in depth. However, that doesn’t mean the session won’t be fun for the participants – it just means that the laughs will come from different experiences. Do your legwork ahead of time with your team. Once you’ve chosen a training workshop, talk to your colleagues about it before they get there. Ask your training consultant or instructor to give you suggestions about how to do this. If there are negative feelings and/or experiences from the past, consider letting people air their concerns so that you and/or the trainer can dispel them prior to the workshop day. 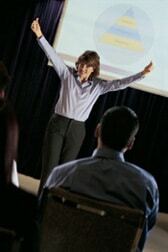 There’s nothing worse for a training consultant than to walk into a classroom prepared to facilitate a great session only to be met by enormous resistance before they’ve even had a chance to speak! Regardless of your experiences with classroom training thus far, studies show in increasing numbers how incredibly valuable it is to the entire workforce to invest in some type of leadership development training. Whether you are looking to improve your communication skills, polish your presentation skills, or develop overall better leadership capacity, there is a training out there for you. Just keep the concepts above in mind when you choose a workshop or facilitator, and your team will be enthused by your activity and love the experience.